A toxic tort case involves people who have sustained an injury caused by exposure to pharmaceutical or industrial toxic substances and are seeking compensation through the judicial system. Toxic tort cases are often filed as class action lawsuits, meaning that the judicial remedy of one case can be applied for everyone in a definable class who has suffered a similar injury. If you or a loved one has become the victim of a serious illness that was caused by exposure to a poisonous substance, you may be eligible to receive compensation. At the law offices of Greg Coleman Law, our toxic tort lawyers have the experience and knowledge to fully litigate your claim and can help guide you through the personal injury litigation process. To learn more about your legal options, call us today at (865) 247-0080 or simply fill out the "Free Case Evaluation" form located to the right. Contact with a noxious substance can result in a number of health hazards and generally arise when a person is exposed to pharmaceutical drugs or occupation-related chemicals. It is important to note that many illnesses that result from exposure can create life changing circumstances for not only injury victims, but also their families and dependents. Loss of wages due to an inability to work is often crushing for many families - especially if they are trying to pay for medical costs and other expenses that are related to their injury. With this in mind, a skilled attorney can help to assemble a robust case to help fight for your maximum compensation benefits. In many instances, it can take years for the effects of exposure to hazardous substances to arise. Cases like mesothelioma, asbestosis have been known to take decades before their symptoms are known to the victim. 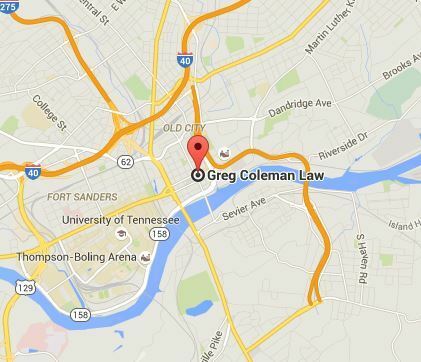 At Greg Coleman Law, we strongly believe that residents of Knox County should have access to comprehensive legal counsel. Keeping that in mind, we proudly work on a contingency-only basis. What that means is that we do not charge you for our fees and services unless we obtain a settlement or verdict for you. For those that are unsure if they have grounds to file a claim, we also offer a 100% FREE initial case review - which allows potential clients to submit their case information to our attorneys, who will then review the details and determine if a lawsuit can be filed. If so, we will then advise on the best way to move forward with the litigation. If you or someone you love has been injured due to exposure to a toxic substance, you may be eligible to receive compensation for mental and physical anguish, lost wages, medical costs and loss of quality of life. Our attorneys have decades of experience helping personal injury victims and have recovered hundreds of millions of dollars in compensation for our clients. We have the experience, knowledge and determination to fight for your MAXIMUM compensation benefits. To find out how we can help, please call our Knoxville location at (865) 247-0080, and a member from our intake team will collect some information about your incident, and then quickly refer you to one of our attorneys - it's that easy. If you would like to start immediately, simply click "here" and fill out the "Free Case Review" it's 100% FREE to send and we will contact you shortly after receiving your message.